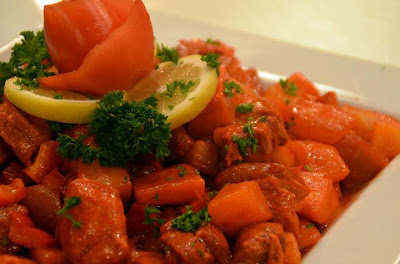 Mechado is really of Spanish origin, but since we Filipinos love to innovate food, we made our own version of Mechado. Instead of using beef, the one which is commonly used, we use the “pork”, since it is much cheaper but other meats can also be used like chicken etc. So basically, this pork mechado is just one of our tomato-based dishes, alongside with it are menudo, afritada and Kaldereta. This dish, the “Pork Mechado” is just easy to cook, though the name sounds complicated, it’ll just took you an hour or so to cook this dish. So, first thing you got to do is to buy and prepare all the needed ingredients, don’t worry because all the ingredients can be easily bought on stores. Don’t forget the most essential ingredient, the UFC Banana Ketchup, because that will give your dish the best taste. Next is, you have to track all the given instructions below. Take note of the cooking time limit; be sure that before you remove the pan from heat, the meat is already tender. So, in this, the star ingredient is the UFC Banana ketchup. It is fortified with Vitamins A and B6. This ketchup completes the overall taste of this dish. Though they may be some alternative for this, I doubt if the dish will be the same without this ketchup. So, since you are now oriented with the “what-to-dos” I bet, you can now start cooking! Have a good time! In hot pan, sauté garlic and onion in oil and margarine. Add in sliced tomatoes and sauté for few minutes. Next add pork and sauté for a couple of minutes. Pour in ½ cup of water, sliced potatoes, carrots and red bell peppers. Simmer for about 15 minutes. Add UFC BANANA KETCHUP and season with salt and pepper to taste. Simmer until fully cooked. Serve with rice.